Sometimes the drawing you want takes years, sometimes it just seems to flow right out of your fingertips on your first try. Perhaps the secret is to wait until there is no option. I drew this pattern on the morning of a friend’s birthday bash. Actually, I think this might have been a double-up – these two have birthdays just a few weeks apart. 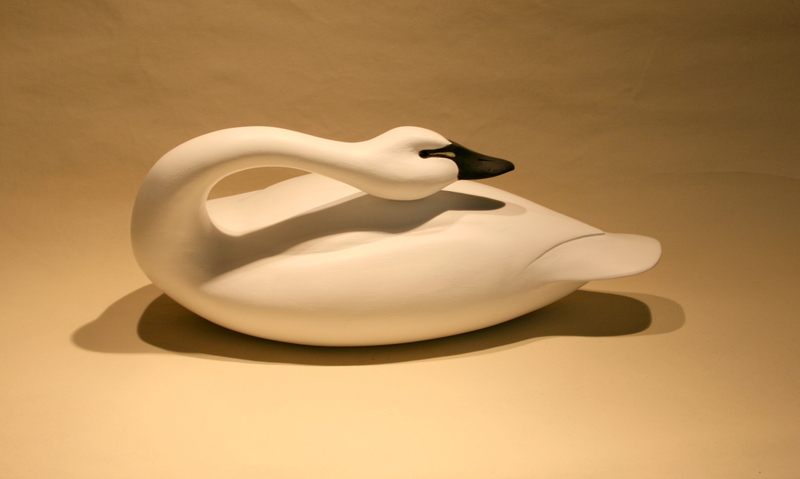 Nevertheless, my gift to the “Golden Retriever – the fair-haired female of this couple – was to be a “kit” for a Swan decoy. She had never carved before and yet wanted to start with a Swan. In response, I had to trot out the title from a favorite book: “First you row a little boat”. Life-size Swans present all sorts of challenges – and the scale just does not fit the average hand. So, I decided upon a half-size Tundra Swan. I picked this species for two reasons. First, it is the native Swan we are most likely to see. As a one-time Waterfowl Biologist and later Director of NY’s Invasive Species Office, I could not abide that Eurotrash Mute Swan ! And, to my eye, the Tundra – which most of us first learned as the Whistling Swan – is the most trim and graceful of its tribe. I also love that little teardrop in front of its eye. In any event, the curves and proportions and “the look” I wanted appeared on my paper right away. And, I was able to find all the right size pieces of White Pine in the shop and did not break my only bandsaw blade in sawing them out. With a pair of nice black eyes and a small tub of filler, the gift only needed to be wrapped. Of course, the giving did not end when the party was over, with the usual disarray of stale drinks and staler cake crumbs. In the following days, I mentored Ms. Golden through the process, especially the carving. Actually, I really just had to provide an introduction. Her hands and eye took over quickly – like a duck to water? – and she took it through to completion. I did not complete my own until a few years later – it is the one you see above. I did , however, carve a few heads right away. The first head I carved was from a piece of Cypress. A bit harder than White Pine, Cypress has a beautiful grain but, more important here, it is naturally rot-resistant. The shape and size of the neck just beg to see service as a handle – maybe on our camp but definitely on my shop. 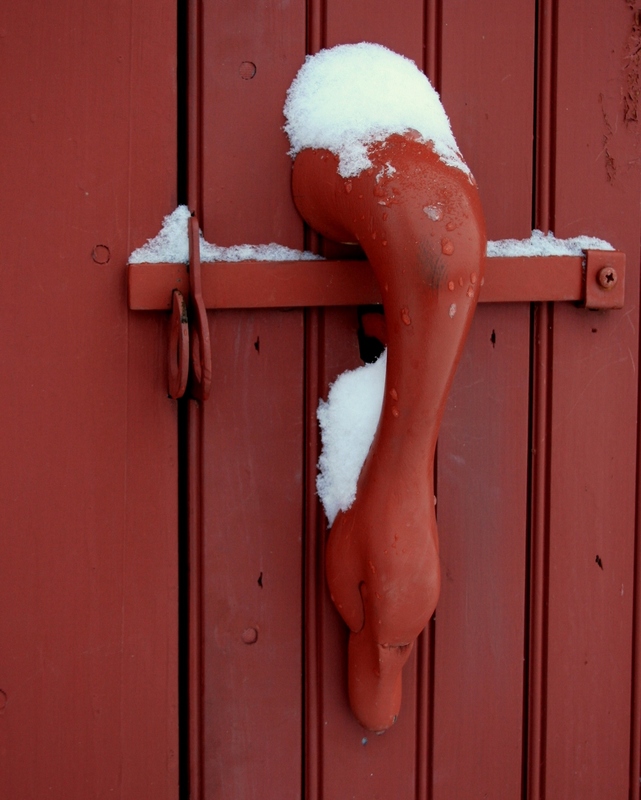 So, I found the pieces from an old carriage house door latch and fashioned this handle to welcome visitors. It is aging well and now wears a very nice patina.